ESSENDON could avoid claiming the wooden spoon after a Joe Daniher masterclass steered the Bombers to a 24-point win over Carlton. The Dons secured their third win of the year with a comprehensive victory over the Blues at the MCG on Saturday, which drew them level on wins with the 17th-placed Brisbane Lions. The Lions are ahead on percentage (61.5 to 61) but if they lose to St Kilda at Etihad Stadium on Sunday by roughly eight goals or more they will be relegated to bottom position. It would see the Bombers avoid finishing last for the first time since 1933, despite the season-long suspensions to 12 of their senior players for anti-doping breaches. The Bombers didn't play like a team worried about losing their grasp on the No.1 draft pick, controlling the contest and running out 15.13 (103) to 10.19 (79) winners to close their challenging 2016 campaign on a high note. Daniher was the standout, booting five goals – from all parts of, and outside, the forward 50 – to spearhead the Bombers to victory. His haul meant Essendon broke the 100-point barrier for the first time this year in the final round. The 22-year-old's goalkicking has been the subject of much scrutiny this week and throughout the year but he put those pressures to one side to lead the Bombers and highlight his potential to be a star of the competition. Daniher's final goal tally for the season (43) made him the first Bomber to surpass 40 goals in a season since Matthew Lloyd in 2008, and should catapult him towards a more productive 2017 with more experienced company back around him. "He's a quality footballer who's got a bright future ahead. But he's like us as the Essendon Football Club," said coach John Worsfold after the game. "We've got a lot of hard work ahead to reach where we want to get to. Joe's the same, he's still a very young footballer but I see the desire for him to do the work to become the footballer I know he can be." Fellow emerging Dons star Zach Merrett overcame a slow start to finish with 34 disposals – the 12th time this season he has surpassed the 30 mark – while first-year midfielder Darcy Parish worked into the game to finish with 23 touches. And on a day when the Dons thanked the service of their ten 'top-up' players this season, it was fitting defender Matt Dea (27 disposals, seven rebound-50s) had one of the best games of his promising season as he pushes to win a full-time contract on Essendon's list. Carlton's offering was a limp way to end the season, particularly after their win over Melbourne last week broke a nine-game losing streak. Midfield duo Patrick Cripps (32 disposals, eight tackles) and Bryce Gibbs (30) tried hard, and former Crow Matthew Wright again chipped in with three goals. Nick Graham provided some life up forward without nailing his shots and Kade Simpson (35 disposals) was his usual reliable self off half-back, but the Blues were outplayed from the start. "We were disappointed with our appetite to defend in the first half. And then by the end of it we had 61 inside 50s and were in front on contested possession but just didn’t hit the scoreboard," Blues coach Brendon Bolton said. "Full credit to 'Woosha' and his young side, they attacked the game in terms of offense particularly in the first half and I don't think we had enough appetite to defend." Essendon had the better of the first term but its array of skill errors coming out of defence kept the Blues in the contest, although Carlton's inaccuracy in front of goal prevented it from making the most of those chances. The Bombers' four-point lead at the first change had plenty to do with their youngsters, with second-year pair Kyle Langford (two majors) and Jayden Laverde (one) their only goalkickers, while veteran captain Brendon Goddard collected 12 touches to offer a steady hand through the midfield. Langford's third goal – a clever snap from the pocket – kickstarted a period of dominance for the Bombers, who then booted five straight behinds before Daniher converted a shot from in front. 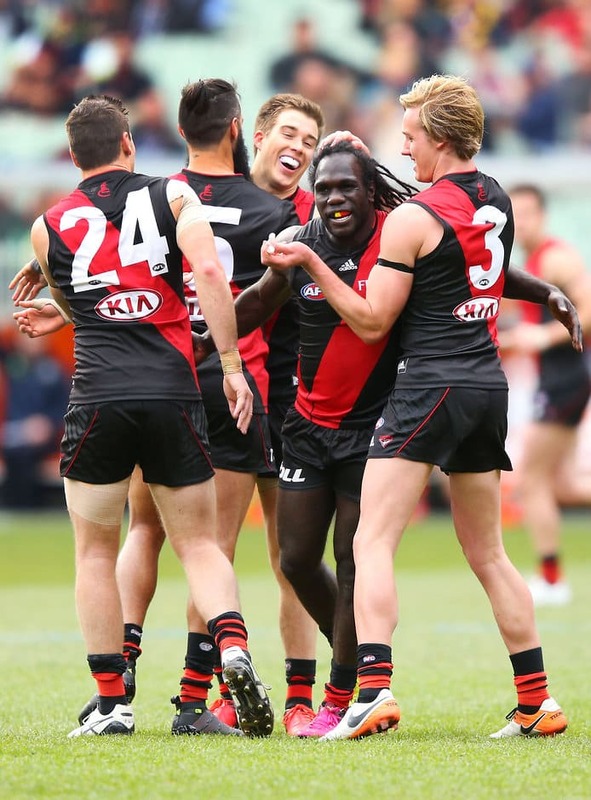 With a layer of class, Daniher set up teammate Anthony McDonald-Tipungwuti for a goal, before Daniher kicked another to put the Bombers 32 points up. That sparked Carlton into action, with the Blues controlling the play for the rest of the quarter and kicking the next three goals. They began to gain ascendancy at the stoppages – where they bullied and beat up Melbourne last week – and improved their efficiency with the ball. But a late goal from Daniher, his third of the term, steadied the ship for Essendon and they headed into the main break with a 19-point lead. McDonald-Tipungwuti started his time at Essendon last year training as a small forward before the suspensions to key players saw him moved to a half-back role. It is where he has made his name, but Worsfold threw him forward against the Blues and he showed his natural flair, booting three third-term goals to help the Bombers kick away. Carlton was never going to turn around its 47-point deficit at the final change, lacking the firepower and focal points in attack to dominate scoring. And besides, Essendon wasn't going to let them get back into things. After such a long year (make that four years), the cloud was about to be lifted. Essendon was determined to celebrate the moment with a win. Essendon: Midfielder David Zaharakis left the field with a knee concern when Simon White slid into him at ground level in the first term, but he returned to the field later that quarter and played out the game unconcerned. Carlton: The Blues appeared to get through the contest unscathed. That's it for 2016 for these sides. Expect busy off-seasons for both clubs as they try to piece together lists that will see them push up the ladder next year.